Although Sadie King is blessed with the voice of an angel, she never thought that following the song in her heart would take her far beyond the strict boundaries of her Amish faith and away from the only home she’s ever known. But during her rumspringa, one road leads to another, and suddenly she’s secretly performing with a band. Now she faces an impossible choice between the music in her heart and the traditions branded upon her soul. Mike Trueherz is a dedicated young paramedic who finds a kindred spirit in Sadie. Torn between family duty and his desire to pursue a life beyond his father’s rural medical practice, he is inspired by Sadie’s honesty and courage. While spring unfurls rich colors and bounty through the countryside of Lancaster County, Sadie and Mike must reconcile their families’ expectations with their own callings. Ultimately, their faith in each other and the God that has brought them together will give them the strength and the peace to take a chance—and to make the biggest decision of their lives. A SIMPLE SPRING is the second book in Ms. Lauer’s Amish series, A Seasons of Lancaster. Readers will want to read the first book, A Simple Winter, first and then look for A Simple Autumn as the books all tie in together. Sadie is struggling to find her place. It is time to join the church, yet to do so means giving up her music. She is doing things no Amish girl has done before, singing on the stage in bars. Plus she is dating an Englisch man, the leader of the band, although she knows she’ll never want to marry him. Mike is struggling with his choices as well. His parents are pressuring him into the medical field—a position he is born and bred to, but he just isn’t so sure that’s the right choice for him. When these two individuals meet and start becoming friends, it becomes complicated. As other readers have said, this book is slow. Sadie makes some really bad, childish decisions. And she is argumentive—rebelling against her older brother. Totally realistic, but difficult to read sibling squabbles. I liked Mike. He reminded me a lot of my son. A totally sweet, caring man, that people automatically trust—a great trait for a doctor. Or any other career. If you like Amish fiction, the A SIMPLE SPRING is a good choice. $15.00. 400 pages. EXCLUSIVE OFFER to Join Kingdom Racing at the Grand Prix of Houston, October 4-6, 2013! October brings YOUR chance to go behind the scenes with Kingdom Racing while taking in the excitement of the Grand Prix of Houston as it returns to the Reliant Center. For a LIMITED TIME ONLY, we are offering exclusive ticket packages to our supporters with VIP access to the Kingdom Racing Hospitality Unit to meet and mingle with team personnel before the race! Two (2) Access Passes to the Kingdom Racing Hospitality Unit the day of the event. Food and drinks included. In addition, the first 25 orders will also receive a free gift from Kingdom Racing. This offer is limited in supply and must be reserved and paid in full by Monday, July 15, 2013. *Please specify the amount in multiples of $1,000.00 and note the number of ticket packages desired in the comment field upon submission. THE COURIER OF CASWELL HALL is part of Summerside’s An American Tapestry series, and it’s great. Actually, beyond great. It’s awesome. I cried my way through the prologue and set myself for a let down when I started the first chapter… NO! The story gripped me and held on. I couldn’t put this book down until I finished it! Spectacular, terrific, you choose the adjective. If you like historical stories set during the Revolutionary War, then you’ll want to read THE COURIER OF CASWELL HALL. $14.99. 336 pages. About the author: Melanie Dobson is the author of twelve novels; her writing has received numerous accolades including two Carol Awards. Melanie worked in public relations for fifteen years before she began writing fiction full-time. Born and raised in the Midwest, she now resides with her husband and two daughters in Oregon. Show Me A Story is a paperback book that will show parents and teachers how to set sail on storytelling adventures. Show Me A Story includes forty fun and rewarding activities which encourages children to shape their imaginations into rich narratives. Doing craft projects especially designed to jump-start story-telling, kids can draw, play with words, explore the outdoors, and create characters and settings with everything from stones to rubber stamps. Show Me A Story includes a list of supplies you will need so you can make sure you have the supplies on hand, and it includes tips to make the creative process go smoother. It also includes other ideas so you can expand or do something slightly different than the project shown. g it to myself more often than not. Unsolicited advice on topics like finances, childrearing, cooking, or housekeeping masked behind “I’m just trying to help”—are a recipe for conflict. To your son’s wife, it sends the message that what she’s doing isn’t acceptable—she may feel you’re attempting to control her and the home she’s making for her family. The need to control never comes from a position of love. It comes from a position of fear. Let it go. Instead, set your heart to pray for your daughter-in-law, to encourage her, to learn what’s important to her. I’d never been interested in the sport of running until DIL Penny joined our family. I’m looking forward to attending a race that marks her return to competitive running after the birth of my grandson. She’s her regaining her strength and speed. It’s been fun to share in her success, and I’m so proud of her. When you appreciate the young woman your son has chosen, the need to point out her shortcomings becomes less tempting. Once you see her as God made her to be, you stop seeing flaws and you value her in a new way. I recently shared an important lesson with a young friend, raising two little boys. She can’t imagine a woman could ever be good enough for them. “If you make your sons the center of your world,” I told her, “you will be devastated, because you will never be the center of theirs.” She nodded, her eyes brimming with tears, the truth of the words sinking into her heart. Here are the tips I shared with her. • Accept the Word as the authority on family order. The Lord is clear on this. The covenant we make is with our husbands, not our sons. Scripture in both the Old and New Testament all carry nearly identical passages about leaving and cleaving. It’s critical we acknowledge and submit to this principle. If it’s God’s plan for the family, it should be our plan. • Surrender your need to advise. This can be tough, but’s not optional. Wait till she asks, or until God prompts you. She may do things differently than you, but different is not wrong, it’s just different. • Pray for your son’s spouse-to-be. Son still single? Pray! When our son proposed after a very brief courtship, friends questioned my calm. The answer was simple: I had prayed for her all of his life. My heart recognized her the moment I met her. I experienced peace, certain of his choice. Praying for your son and his future wife when they’re still children also helps to prepare your heart. So no matter his age, pray. Start now. When you are willing to honor your son’s choice, you are honoring God and walking in obedience. I didn’t lose my sons; I gained three wonderful daughters. What a gift. The boys did not necessarily want a girl “just like the girl that married dear old dad.” We are unique, different from one another, but we share a love for Jesus and the desire to live life together successfully as a family. I learned to think of the differences as a gift. Different isn’t wrong—it’s just different. Amazing how much easier it was to suspend judgment when I stopped comparing my way to theirs. I’ve been surprised by how much they can teach me if I’m open to learning. We’ve grown closer as a result. I know these are smart girls—they think my boys are wonderful! Deb DeArmond is an expert in the fields of communication, relationship and conflict resolution. A writer and professional speaker, Deb focuses on topics related to the family and women. 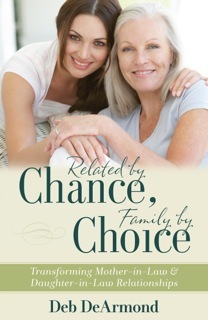 Kregel Publications will release her first book in November 2013 entitled, Related by Chance, Family by Choice, focused on relationships between women-in-law. She is co-founder of My Purpose Now, a website devoted to Christian women 50+. Read Deb at Family Matters/Deb DeArmond and My Purpose Now. The 365 POCKET DEVOTIONS were adapted from The One Year Walk With God Devotional and The One Year At His Feet Devotional. Learn to walk more closely with God each passing day! 365 POCKET DEVOTIONS is a convenient, easy-to-carry, quick-access book containing daily reflections on topics like trusting God, making wise choices, and loving others. Each day begins with an inspirational, thought-provoking reading and ends with a promise from Scripture. A new edition in the popular 365 Pocket series that has touched so many lives, 365 POCKET DEVOTIONS is created specifically for those who want daily devotional time with God. The 365 POCKET DEVOTIONS is the perfect size to carry in your purse or pocket or to store in the glove compartment of your vehicle. It is a orange color with flower petals, really cute design, with the title pressed into the cover. We used the 365 POCKET DEVOTIONS for a month, and I asked each member of the family what they thought. Everyone liked it a lot – and recommended it. The devotions are short, easily read in a few minutes, and there is a verse included to think on. If you are looking for a new devotional then 365 POCKET DEVOTIONS is one to consider. $13.99. 320 pages. When a doctor who attracts danger falls for a cook determined to make it on her own, there's going to be trouble in Texas! Glynna Greer came west as a mail-order bride and ended up in a bad situation. Now her husband, Flint, is dead, and she's determined to make a go of it on her own. In a town full of men, Glynna decides she can support her two children by opening a diner--never mind that cooking is not her greatest talent. Dare Riker is a doctor who saves lives, but someone seems determined to end his. It may have something to do with the traitors he dealt with during the Civil War, or it might be related to the recent incident with Flint Greer and the ranch. Whoever the culprit is, he or she seems really fired up, and Dare can't let his guard down for a moment--which is a challenge, since right now he's trying to win the heart of the recently widowed Glynna. Though his doctoring business is booming due to Glynna's questionable cooking, Dare seems to encounter unexpected dangers wherever he goes. There's the avalanche. And the fire. And then the shadowy figure with a knife. Can Dare survive it all long enough to convince Glynna to take another chance on love? FIRED UP is the second book in Ms. Connealy’s Trouble In Texas series. The books easily stand alone, but readers will want to read Swept Away. Glynna was married to an abusive man…men… but she doesn’t hesitate to stand up for herself. She is strong-willed, determined, and convinced that Dr. Dare is a half-wit. Dare is equally strong willed, but not determined enough to make sure he gets his way when Glynna is determined to ride right into danger. There is a lot of telling in the book. I didn’t get as close to the characters as I would’ve liked—but there is non-stop action that is almost exhausting. Bang, bang, bang… everything at once, from rockslides and an Indian camp full of measles and on and on. The action will keep the reader reading. Fans of Ms. Connealy or western historical romances will want to read FIRED UP. She is the best western historical writer out there—and award-winning—with good reason. 4 stars—only for the telling and the distance from the characters. $14.99. 336 pages. Meet Mary: Mary Connealy writes fun and lively "romantic comedy with cowboys" for the inspirational market. She is the author of the successful Kincaid Brides, Lassoed in Texas, Montana Marriages, and Sophie's Daughters series, and she has been a finalist for a Rita and Christy Award and a two time winner of the Carol Award. She lives on a ranch in eastern Nebraska with her husband, Ivan, and has four grown daughters. Do you have a struggling student who can’t grasp reading? According to surveys, sixty-eight percent of students older than third grade are struggling readers, and a great majority of them don’t even know their alphabet—or phonic sounds. Try Reading Again is a new book and cd-rom that will show you how to motivate and teach older beginners, ages ten and up. Try Reading Again incorporates a triangle reading approach which starts with language experience stories (not meaningless ones), then moves up to phonics/phonemic awareness, then up to fluent reading of structured stories by authors. Students who haven’t been successful with reading have barriers to further learning. Many times they’re frustrated and would rather not try than fail again. Try Reading Again will teach you how to motivate your students and researchers have found that students who read stories about their own experiences are much more motivated to read. The Phonemic Awareness teaches how to internalize phonics so must older struggling readers can move past the 100 or so words they memorized. Ultimately, the goal is to reach structured stories, so Try Reading Again includes structured stories with age appropriate content and pictures. A handy CD-ROM includes worksheets, activities, and additional stories which makes it a cinch to print multiple copies to share with many students and to repeat exercises. In the spring of 1822, Ellie Ballantyne leaves finishing school and returns to the family home in Pittsburgh only to find that her parents are away on a long journey and her siblings don't seem to want her to stay. Determined to stand her ground and find her place in the world, Ellie fills her time by opening a day school for young ladies. But when one of her students turns out to be an incorrigible young member of the Turlock family, Ellie knows she must walk a fine line. Slaveholders and whiskey magnates, the Turlocks are envious of the powerful Ballantynes and suspicious of their abolitionist leanings. As Ellie becomes increasingly entangled with the rival clan--particularly the handsome Jack Turlock--she finds herself falling in love with an impossible future. Will she betray her family and side with the enemy? LOVE’S AWAKENING is the second book in Ms. Frantz’s Ballantyne Legacy series. Readers might want to read Love’s Reckoning first, though the books do stand alone. I enjoyed Love’s Reckoning but LOVE’S AWAKENING fell a little flat for me. Jack and Ellie don’t spend a whole lot of time together and most of the book seems centered around Ellie and her siblings, than on the romance. I have loved Ms. Frantz’s books in the past, so was looking forward to this one. It was slow, easily put down, and it never did pick up. I also really never fell in love with Ellie. Jack… at times I liked. I did enjoy the historical research Ms. Frantz did and included in the book. A peek at the third book, coming in Fall 2014 is included at the end of the book. $14.99. 416 pages. Charlotte Stevenson’s world has been torn apart. Her estranged daughter, Denise, has been killed in a car accident, leaving her three children orphans. According to Denise’s will, she has named Charlotte as care-giver. So Denise flies out to California to bury her daughter and take the three children back to rural Nebraska to Heather Creek Farm to live. But everything is not automatically a bed of roses. Sixteen year old Sam is upset, fourteen year old Emily misses her friends and wants to return to California, and the youngest, Christopher, just wants to fit in. As Charlotte and her husband, Bob, struggle to adjust to having teen grandchildren they don’t know, the three kids struggle to adjust to the death of their mom and a new life far from home. What if Charlotte makes the same mistakes as she did the first time? 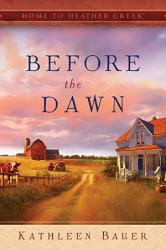 BEFORE THE DAWN is the first book in the new Guideposts series Home to Heather Creek. It was very well written and the emotions are realistically portrayed. I could feel the hurt of the grandparents and the children, and the confusion they all experienced. I enjoyed getting to know Charlotte and her family and friends as they struggled to settle into a routine, with school, chores, and life. The faith message is expertly woven in and isn’t preachy. I enjoyed the realistic touches of life on a farm, learning to drive, and struggling against boundaries that are portrayed in this book. Don’t miss BEFORE THE DAWN, an excellent beginning to a new series. 280 pages. The Slater children are slowly adjusting to life on the Nebraska farm with their grandparents. Sam has no interest in schooling and wants to spend all his time working with his Uncle Pete and his grandfather. Emily is finally beginning to make friends, and Christopher is spending most of his time alone making interesting discoveries. Charlotte is still struggling with having teenage children to raise and not only is she struggling with Sam over his grades, now she learns that someone has been robbing them. Will they find the culprit? And will the family pull together to find the answers? SWEET SEPTEMBER is the second book in the Home to Heather Creek series. Readers will not want to miss the first book in the series, Before the Dawn as SWEET SEPTEMBER is a continuation of that story. The third book in the series, Circle of Grace, will be available soon. I enjoyed learning more about Charlotte, her family and her circle of friends in this well written book. The faith message is expertly woven in, and I enjoyed the way Ms. Goyer took a bit of history and wove it seamlessly into a contemporary novel. 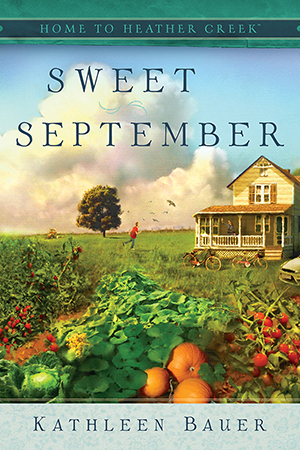 Readers will not want to miss SWEET SEPTEMBER or any of the other books in this series. Visit http://www.shopguideposts.com/ for this book and any other books published by Guideposts. 246 pages. Blog Tour Contest: Since Sweet September is all about family, Tricia wants to meet yours. Leave a comment on the Tricia’s blog tour post (http://triciagoyer.blogspot.com/2008/09/sweet-september-blog-tour.html) sharing who your favorite family member is and why and you’ll be entered into a drawing to win William-Sonoma’s Pumpkin Harvest Loaf Pan & Quick Bread Set. About Tricia: Tricia Goyer is the author of twelve books including From Dust and Ashes, My Life UnScripted, and the children's book, 10 Minutes to Showtime. She won Historical Novel of the Year in 2005 and 2006 from ACFW, and was honored with the Writer of the Year award from Mt. Hermon Writer's Conference in 2003. Tricia's book Life Interrupted was a finalist for the Gold Medallion in 2005. In addition to her novels, Tricia writes non-fiction books and magazine articles for publications like Today's Christian Woman and Focus on the Family. Tricia is a regular speaker at conventions and conferences, and has been a workshop presenter at the MOPS (Mothers of Preschoolers) International Conventions. She and her family make their home in the mountains of Montana . About the books: When the world around you falls apart, could it be that God is giving you a second chance? This is just one of the questions on Charlotte Stevenson's mind as she brings her three grandchildren to live on the family farm in Guidepost Books' Home to Heather Creek series. Before the Dawn begins just one week after the funeral of Charlotte's daughter, Denise. Denise's three children barely have time to process the death of their mother before they must move to the Heather Creek Farm they have never visited with grandparents they barely know. At age 16, Sam is fiercely protective of his younger siblings. Emily is 14 and desperately misses her friends. Young Christopher is only 8 and just wants to fit in. While Charlotte tries to help her grandchildren adjust to their new life, she also wrestles with her own grief and the enormous task of bringing her family together. Bob believes the fastest path to adjustment is a firm routine, with structure and chores, the same way they raised their own kids. However, that route led to Denise running away from home as a teenager and an estranged relationship with her family. Charlotte is worried about making the same mistakes she made with Denise. Is this her chance to make things right? It is spring when the children arrive, and as Charlotte looks around the farm, she hopes the new life around them will signify hope and healing. The miracle of new life, along with God's healing touch, reminds all of them that it's always darkest just before the dawn. Sweet September picks up at harvest time, as the children are settling into a new school year. While the harvest should be an exciting time, the children don't seem to be getting into the spirit. Emily is struggling with farm life, Christopher spends most of his time alone, and Sam is failing school. Trying to learn from what did and didn't work with her own kids, Charlotte is determined to get her grandchildren back on track. As tenuous family bonds threaten to break apart, a mystery on the farm might be the one thing that can bond the family together. Charlotte sets out to uncover the truth, and as the kids unite to find answers, this cobbled-together family learns more about one another and the love that binds them together. The lives of the Stevensons and their grandchildren unfold in this captivating story of the remarkable change that comes from the love of family, the kindness of others, sheer persistence and unshakable faith. As readers follow the Stevensons' inspiring stories, it's almost impossible not feel a part of this friendly, loving community, where God's grace can be seen in every circumstance. About the Author: Kathleen Bauer is the pen name for a team of writers who have come together to create the Home to Heather Creek series. Snow is falling, cookies are baking, and Christmas is just around the corner in Willow Ridge, Missouri, where a new season marks fresh beginnings for the residents of the tranquil Amish town. As another year draws to a close in Willow Ridge, life seems to be changing for everyone but Rhoda Lantz. Her widowed mother is about to remarry, her sister is a busy newlywed, and soon Rhoda will be alone in her cozy apartment above the blacksmith’s shop. An ad posted by an Englischer looking for someone to help with his mother and children may offer just the companionship she’s looking for, but if she falls for the caring single father, she may risk being shunned by her community. Certain she can only wish for things she cannot have, Rhoda must remember that all things are possible with God, and nothing is stronger than the power of love. WINTER OF WISHES is the third book in Ms. Hubbard’s Seasons of the Heart series. Readers will want to read them in order, Summer of Secrets and Autumn Winds. I wasn’t fortunate enough to read either of these books, so I didn’t know the stories of the mother’s and sister’s romances, but there was enough alluded to that I wasn’t lost. Ms. Hubbard is a very talented author. Very clean writing, and an interesting plot. Rhoda is a wonderful caregiver, and Andy’s family instantly falls in love. But someone seems determined to keep these two individuals apart. The characters were a little flat, but the story will still carry the reader. Fans of Amish/Englisch romances will devour this, wondering how the story will end. Lots of yummy recipes are included at the end of the book. $6.99. 334 pages. 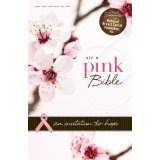 This NIV Bible is a beautiful choice for any woman whose life has been affected by breast cancer. Whether you are a survivor or a co-survivor, the NIV PINK BIBLE brings you timeless words of comfort, hope, and encouragement. Specially written inspirational insights by a breast cancer survivor are sure to encourage you during this significant part of your spiritual journey. The NIV PINK BIBLE: An Invitation to Hope contains the complete text of the New International Version---with reflections and stories to encourage you, and an index to hundreds of Bible verses to comfort you. The NIV PINK BIBLE is just the right gift of hope for mothers, daughters, coworkers, friends---or for yourself. * Presentation page---great for gift-giving. The NIV PINK BIBLE is beautiful. I absolutely love it! As a breast cancer survivor, I like that part of the proceeds go to support the National Breast Cancer Foundation, Inc. and I appreciated the index to verses of hope and encouragement as well as the prayers, reflections and encouragement. The NIV PINK BIBLE would make a welcome and appreciated gift for anyone you know who is going through breast cancer treatments—or a survivor. It is beautiful, thoughtful, and caring. Nothing means more than God when you go through this. Recommended. $34.99, leather bound, red letter. 1184 pages. 5 stars. Someday was a word Mercy Miller held tight to. When childhood playmates grow up and fall in love, the whole community celebrates. But in the case of Mercy and Mick, there would be no celebration. Instead their relationship must stay hidden. Good girls do not date young men from the Maliseet tribe. At least, not in Watsonville, Maine. When racial tensions escalate and Mick is thrown in jail under suspicion of murder, Mercy nearly loses all hope-in love, in her father, and in God himself. SHADES OF MERCY is the first book I’ve read by this writing team. The writing style is descriptive, drawing the reader into the setting. One could almost smell the dump that Mick and his kin live in, set among the beauty of Maine’s North Woods. My heart hurt for the young adults in a relationship forbidden due to racism. The story is rather slow… and easily put down. I didn’t engage with the characters as much as I would have liked to, but it is a good book and excellent for young adults to read as it deals with racism. And that is still somewhat a problem. While people may not blink twice to see whites marry blacks or Hispanics or other races anymore, in some areas there is more… stigma… than other if you are a certain nationality. Good lessons. $14.99. 288 pages. 3.5 stars. Can a woman’s heart find its way back to God and discover an unexpected new love? Will Joel help Mara or take everything she has left? Mara Keegan is an uber-successful mother and a widow of three years. She's been chasing success and all the "good things in life" for her family to make up for the cruel whim God played on them by taking her husband. In an effort to be the perfect mom, she decides to make a photo memory quilt, a graduation present for her daughter, Cadence. She's not yet finished when she experiences a heart attack. How can Mara trust the one man who nearly destroyed her life and business? While Mara recuperates, she's forced to face her physically and spiritually broken heart. The memory quilt must be finished in time for Cadence's big day, but Mara struggles with her burgeoning feelings for the man who must keep Mara's business going during her recovery, Joel Ryan. Can Joel find his way into Mara's heart and onto Cadence's quilt? Or will he betray a vulnerable woman and her children? A HEALING HEART is book six in Abingdon Press’s Quilts of Love series. The books are all written by different authors and are all stand-alones. The story is tightly written, with no unnecessary words. Unfortunately, it felt like some of the life was sucked out of the story too. Despite that, Mara is a middle-aged widow struggling to keep her husband’s dream alive. She is busier than she able to cope with, struggling with maintaining the business, overseeing three active teens and one large dog, and making a memory quilt for her daughter’s high school graduation! No wonder she has a heart attack! Joel might have tried a hostile take-over of the business, but now he is a coach, trained to make wise business decisions. When he’s assigned to Mara’s case, he arrives just in time to get her to the hospital and takes over from there. Mara has no choice but to trust him—and Joel seemed an honorable man, despite his rather iffy past. I enjoyed getting to know Mara and Joel and the children. I especially love the “neighborhood watch grandma” who was a secondary character. Don’t miss A HEALING LOVE. $12.99. 240 pages. In a world where everyone is putting on a show, there is a love that is genuine. Sarah Cummings has one goal in life--to break into Chicago's high society. Desperate to stop serving dinner to members of the wealthy Banning family and to start eating at society tables, Sarah spends her meager free time altering cast-off gowns to create the perfect wardrobe for her future life. When opportunity knocks at a chance meeting, she presents herself as Serena Cuthbert, weaving a fictitious past to go with her fictitious name. But as she gets closer to her goal--and closer to Simon Tewell, director of St. Andrew's Orphanage--Sarah finds that she must choose between the life she has and the life she dreams of. Can she piece together the perfect life from scraps? Or will it all come unraveled in the face of true love? 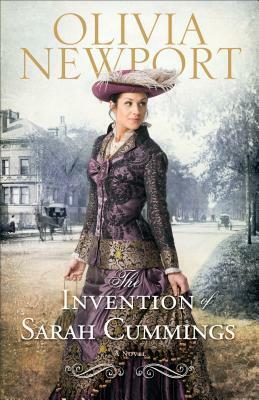 You’ll have to read THE INVENTION OF SARAH CUMMINGS. It kept me engaged until the end. Great book. $14.99. 304 pages. 5 stars.